I’ve been wearing this dress for a few months now. I haven’t had a chance to show it to you yet, so let’s remedy that before it gets too warm out! I’m really pleased with how it turned out. Pattern: This is Lisette for Butterick B6411 with a couple of small changes. Fabric: The soy jersey from Drygoods Design in Seattle is dreamy. Keli has great taste in fabric and always finds really interesting sources, so her offerings are quite different from what you’ll find elsewhere. I love the hand and drape on this fabric, and it was wonderful to sew with. Changes: I knew I wanted to wear a belt with this, so I eliminated the waist seam and gathers. And of course I lengthened the dress by quite a bit, like I always do. 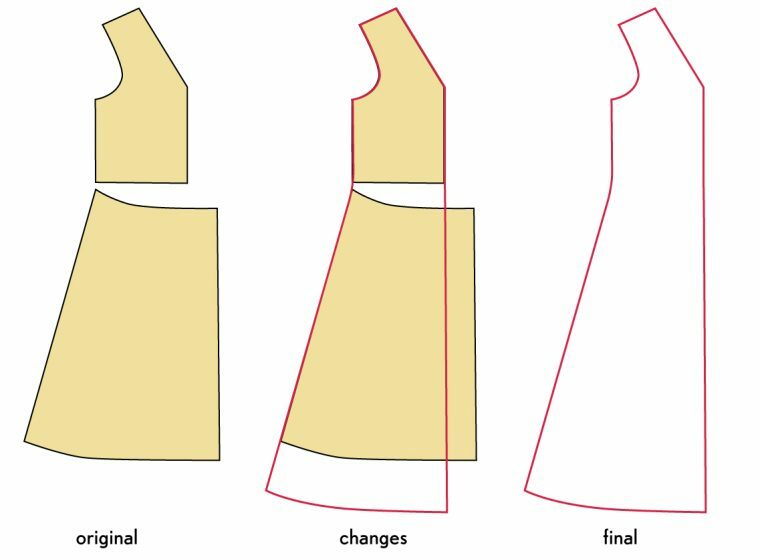 I also added a center-back seam to conserve the fabric I had and to add a little structure to the back of the dress as well. To add a center-back seam, I simple added a seam allowance at the Cut on Fold Line and cut 2 instead of cutting on the fold line. That allowed me to cut the back along the selvedge instead of the center fold line, which was perfect because otherwise I wouldn’t have had enough fabric for the length I wanted. Construction: I didn’t use a serger on this dress at all, but instead sewed it with a longer (2.6 or 2.8mm) straight stitch on my machine, stretching the seams as I sewed. This way I could maintain the wide seam allowances. I don’t really know why I chose to do it this way; I guess I just thought the extra seam allowances felt a little luxurious. In a few places (side seams, center-back seam) I topstitched them down (almost like a faux flat-felled seam but without the folding, since jersey doesn’t ravel) just because I liked the look of it and to help keep them in place so they didn’t curl up the way jersey tends to do. I’ll probably make this again, maybe shorter and in black or navy. I’ve been wearing it a lot, especially in the winter when it was really cold. I like to wear it with a moto jacket over it, too. Thank you for showing the flat pattern work — always my favorite part to see. (And how I understand and learn the best). Once you know what to do it’s so easy, too! I’d love to see how it turns out, Krystyna! I’m absolutely in love with this. From the fabric to the accessories (boots and belt). I would totally wear this. I’ve got my pattern already so thanks for the inspo! Keep up the amazing work! Love your patterns. So pretty on you! I really wanted to make this dress this winter but it is already too hot here. Next year, for sure! Yeah, I was debating how to “summer-ize” the pattern, but I think it’s really a fall/winter style. I loved this pattern as soon as it was released. It was really satisfying to make and I’ve really enjoyed wearing it. It’s lovely to see this version which is so different to the pattern cover picture. Thank you for a great versatile pattern. I love the lines on this dress! But I am moving to Florida soon and well, just don’t have a need for much winter clothing! How difficult would it be to make this a sleeveless summer dress (like one of the inspo pics you shared in your post introducing the pattern)? Just adjust the armscye? Also, soy jersey sounds wonderful, is it breathable/suitable for humid summers, or more of a winter-appropriate fabric?